“Improving the mental health of those in prison will require a step change in effort and resources. 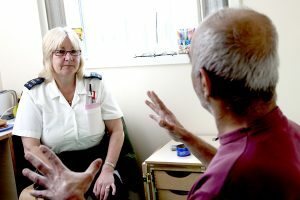 The quality of clinical care is generally good for those who can access it, but the rise in prisoner suicide and self-harm suggests a decline in mental health and well-being overall. The data on how many people in prison have mental health problems and how much government is spending to address this is poor. Consequently government do not know the base they are starting from, what they need to improve, or how realistic it is for them to meet their objectives. Without this understanding it is hard to see how government can be achieving value for money." Government¹ does not know how many people in prison have a mental illness, how much it is spending on mental health in prisons or whether it is achieving its objectives. It is therefore hard to see how Government can be achieving value for money in its efforts to improve the mental health and well being of prisoners, according to a report by the National Audit Office. Her Majesty’s Prisons and Probation Service (HMPPS), NHS England and Public Health England have set ambitious objectives for providing mental health services but do not collect enough or good enough data to understand whether they are meeting them. Rates of self-inflicted deaths and self-harm in prison have risen significantly in the last five years, suggesting that mental health and well-being in prison has declined. Self-harm rose by 73% between 2012 and 2016. In 2016 there were 40,161 incidents of self-harm in prisons, the equivalent of one incident for every two prisoners. While in 2016 there were 120 self-inflicted deaths in prison, almost twice the number in 2012, and the highest year on record. Government needs to address the rising rates of suicide and self harm in prisons as a matter of urgency. In 2016, the Prisons and Probation Ombudsman found that 70% of prisoners who had committed suicide between 2012 and 2014 had mental health needs. The Ministry of Justice and its partners have undertaken work to identify interventions to reduce suicide and self-harm in prisons, though these have not yet been implemented. While NHS England uses health needs assessments to understand need these are often based on what was provided in previous years, and do not take account of unmet need. The NAO estimate that the total spend on healthcare in adult prisons, in 2016-17 was around £400 million. HMPPS does not monitor the quality of healthcare it pays for in the six privately-managed prisons it oversees. The prison system is under considerable pressure, making it more difficult to manage prisoners’ mental well-being, though government has set out an ambitious reform programme to address this. NOMS’ (National Offender Management Service) funding reduced by 13% between 2009-10 and 2016-17, and staff numbers in public prisons reduced by 30% over the same period. When prisons are short-staffed, governors may run restricted regimes where prisoners spend more of the day in their cells, making it more challenging for prisoners to access mental health services. Staffing pressures can make it difficult for prison officers to detect changes in a prisoner’s mental health and officers have not received regular training to understand mental health conditions, though the Ministry plans to provide more training in future. In addition, NOMS did not always give NHS England enough notice when it has made changes to the prison estate. For example at Downview Prison NHS England was in the process of commissioning health services for a male prison, when NOMS decide to open it as a female prison instead. When NAO visited six months after it opened, the prison was still in the process of developing a healthcare service that could meet the needs of the female population. The challenges of delivering healthcare are compounded by the ageing prison estate, over a quarter of which was built before 1900 and without modern healthcare in mind. The Ministry has a programme to replace the ageing estate with modern buildings. While clinical care is broadly judged to be good, there are weaknesses in the system for identifying prisoners who need mental health services. Prisoners are screened when they arrive in prison, but this does not always identify mental health problems and staff do not have access to GP records, which means they do not always know if a prisoner has been diagnosed with a mental illness. NHS England is in the process of linking prison health records to GP records to address this. Mentally ill prisoners should wait no more than 14 days to be admitted to a secure hospital, but only 34% of prisoners were transferred within 14 days in 2016-17 while 7% (76) waited for more than 140 days. The process for transferring prisoners is complex and delays can have a negative impact on prisoners’ mental health and they may be kept in unsuitable conditions such as segregation units.